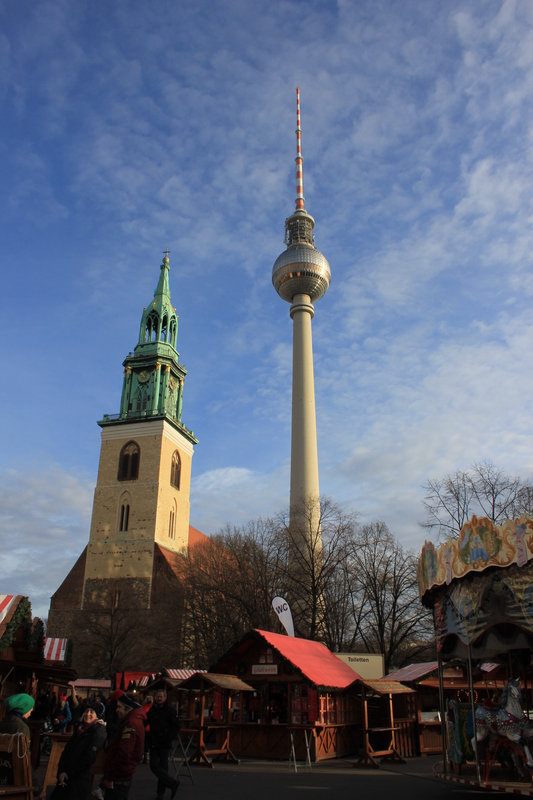 When you stay in Berlin the skyline tends to be dominated by one structure in particular. 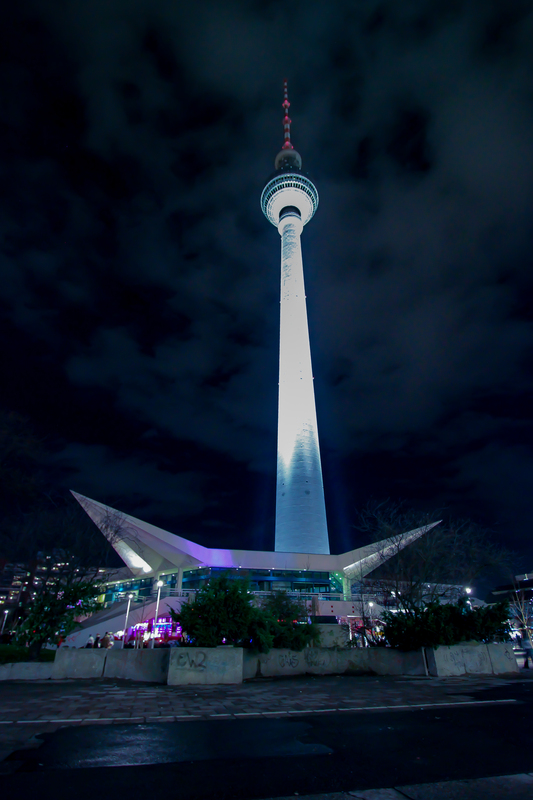 This is the TV Tower, the Fernsehturm. 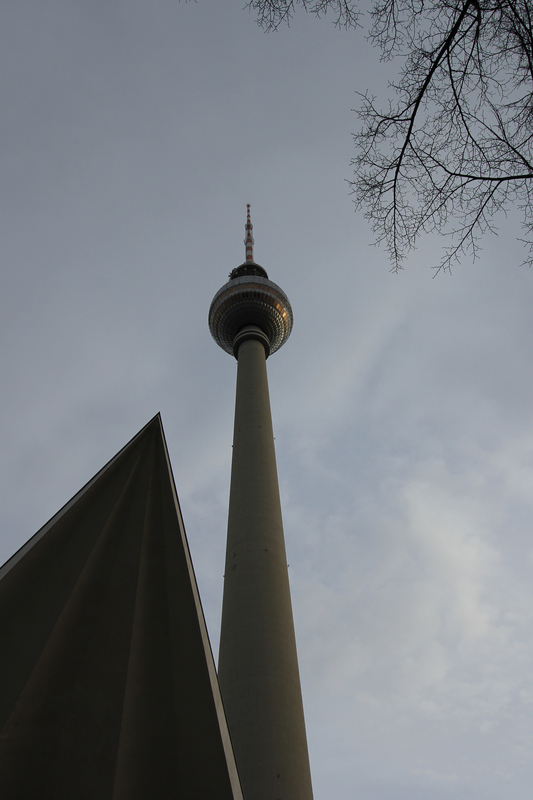 If you happen to stay in a hotel close to this tower, then you are never lost in Berlin. Wherever you are, you need only to look up and spin around like a compass in order to find your guide home. The Fernsehturm is even lit up at night so you can always find the way back to your hotel, no matter what time of day it is. Built in 1969 and standing 368 metres high, it is the tallest building in Germany and a member of the World Federation of Great Towers. Intended as a symbol of socialism by the East German government, it is today a symbol of a unified Berlin. 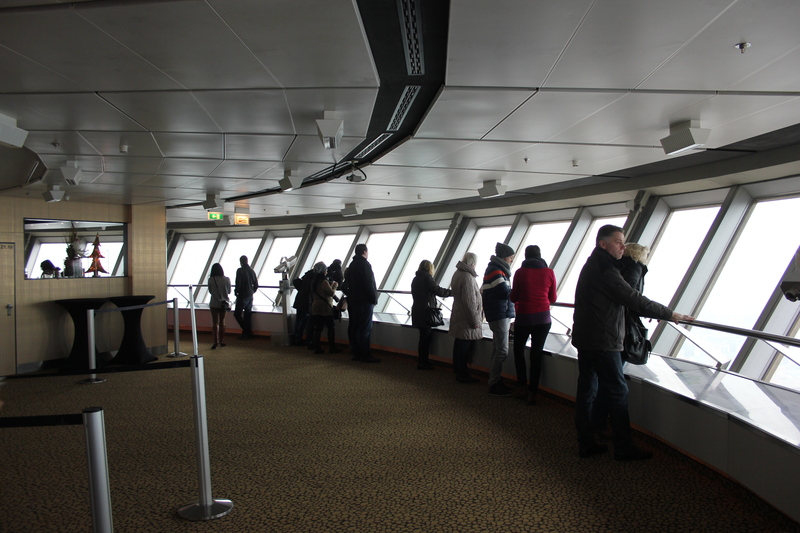 A significant tourist attraction, tickets can be bought for a visit to the internal viewing platform, 203.78 metres up. The tickets are well worth the money, for the views are truly magnificent. We bought ours online before flying out to Germany, allowing us to bypass the queues (which turned out to be minimal in any event). We pre-booked a morning which turned out to be somewhat on the foggy side, but even then we weren’t disappointed. Running around the sphere are two levels of tinted windows. The lower is the viewing platform. The upper is a restaurant where, for a further fee, you can have the highest meal in Berlin. On the basis that this restaurant seems to have a poor reputation we did not bother with this, and stuck to the lower level. We wandered around the 360° platform several times. All the way around the perimeter large information boards pointed out landmarks and points of interest. 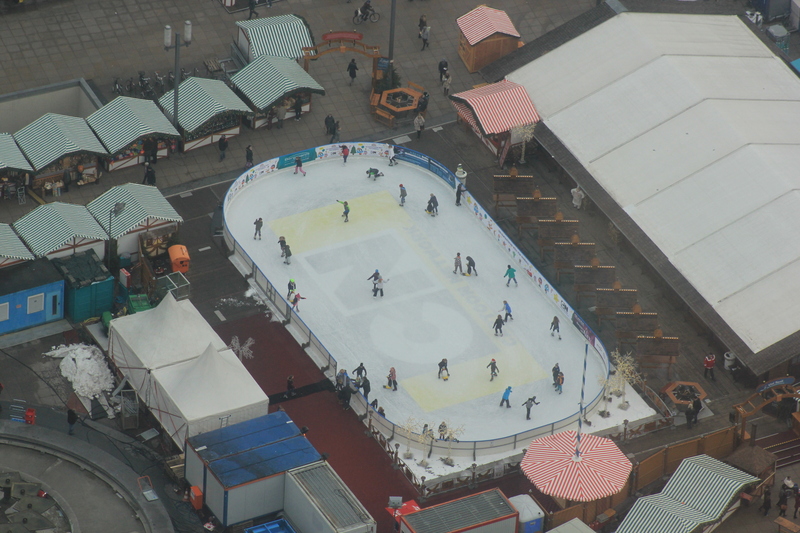 Beneath us we could see the Alexanderplatz Christmas Market, where skaters scurried around the ice rink like ants. What was most interesting, however, was the stark contrast between what was West Berlin and what was East Berlin, which can only really be appreciated from a bird’s eye position like this. What was formerly West Berlin looked like a relatively standard cityscape. Buildings of different styles peppered the horizon in a colourful array. 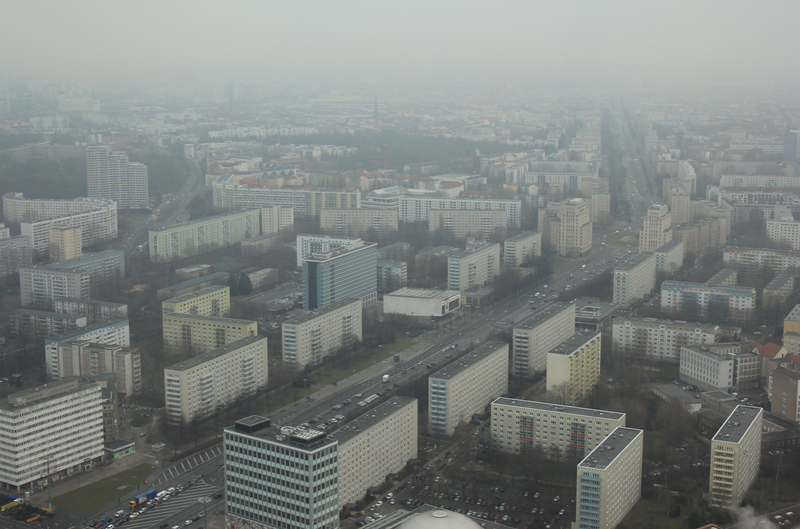 The former East Berlin, however, was dominated by a drab concrete jungle, filled with uniform blocks. The full array of 50 shades of grey were laid out in front of us around Karl-Marx-Allee, complimenting the cold, drab morning. 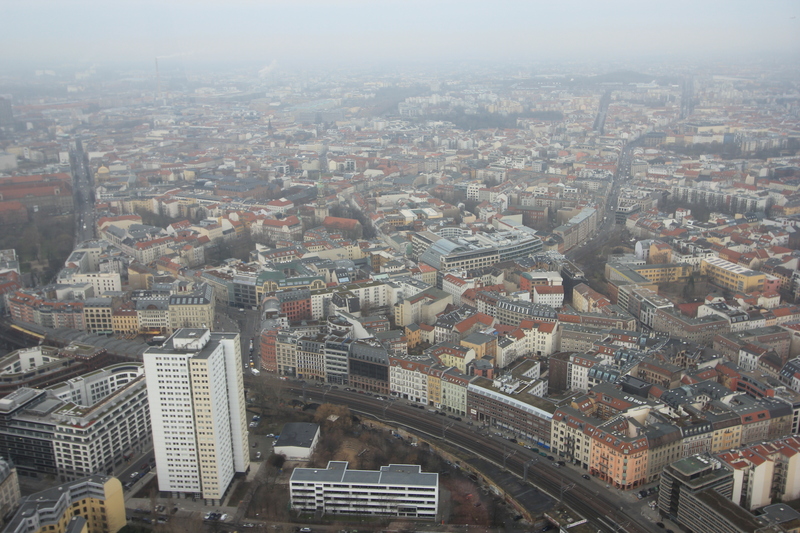 Whilst we had realised that parts of the city near our hotel were slightly more “East” than “West”, the difference between the two former halves was really brought home to us by the view from Fernsehturm. 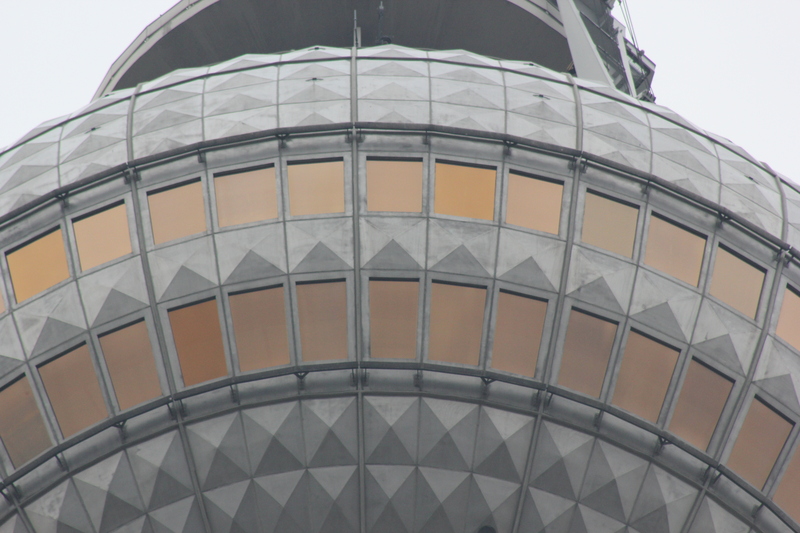 If you happen to be in Berlin the trip up the Fernsehturm is well worth it. This entry was posted in Germany and tagged Berlin, Fernsehturm, tower, travel, World Federation of Great Towers. Bookmark the permalink. When the sun shines on the top of the tower the reflection forms a cross. Before the wall came down it was known as the Pope’s Revenge. Thanks for your comment – I read about the cross in the sun, but the sun was not on our side during our visit so we didn’t get to see it for ourselves. I didn’t know it got to have a formal name though! Thanks for the comment!